Maybe I should get a new console and go back to my console gaming habits. I’m really dying to know how could a video console fare up as a social networking device. I mean, a couple of days ago Sony announced that the Playstation 3 now supports Facebook updates. Â For me that was awesome, and now here comes this report saying that more users or gamers if I may say so are doing their social networking chores on Xbox Live. What the? 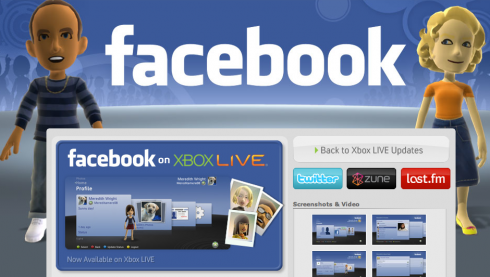 Is it just me or are you aware that at least 2 million Xbox Live users have used their console to log-in to Facebook , while half of them used it to create a Last.fm account? Â In addition, Â the number of gamers who are using the Xbox Live to tweet are also increasing. In a statement released today on the Last.fm blog 3 of the founders of the London (UK) based music discovery and recommendation service are leaving the CBSi Music company. According to the blog entry this is the latest (last?) step in handing over the reins to CBSi Media, who acquired Last.fm in Spring 2007 for $280million. After two years running Last.fm within CBS we feel the time is right to begin the process of handing over the reins. This is the latest stage in a long journey for us founders, which began in a living room in East London in 2002, and took us to the headquarters of one of the biggest media companies in the world. Felix Miller also announced that the service more than doubled in number of unique monthly users over the last 12 months (Compete stats for last.fm top-url show an increase above 50% over the last 12 months). mSpot, Inc. announced a deal with CBS RADIO and Last.fm that will add over 100 live local radio stations across the U.S. and the Last.fm personalized radio service to mSpotâ€™s expansive mobile radio line-up. The new offering gives AT&T Wireless customers access to one of the most customized listening and entertainment experience in the market, combining the best of personalized radio; local music, sports, news and talk radio stations; and commercial-free music choices. As a premiere mobile music and entertainment company, mSpot services over 4 million mobile users in North America. Among the stations licensed by CBS RADIO are KROQ-FM (Los Angeles, Calif.), WFAN-AM (New York, N.Y.), and WXRT-FM (Chicago, Ill.). Through Last.fm, users will be able to listen to recommended music, create their own stations, and access artist bios. mSpotâ€™s radio applications allow customers to browse content, skip through songs on select stations, access recently-played stations, and bookmark favorite stations. mSpotâ€™s radio network currently spans across AT&T, Sprint, Bell Mobility, Telus, and U.S. Cellular. In total, mSpot has over 100 commercial-free music channels, over 200 local stations, and over 30 stations of talk content from popular media firms including ABC, Fox Sports, NPR, Disney, SportingNews, MarketWatch, PRI, AccuWeather and Traffic.com. Last.fm has launched on the Android platform, offering an ‘on-the-go’ music application enabling users to access all the best of Last.fm from their mobile phones. Features include similar artists and genre-specific streaming radio stations, personalized streaming radio, up-to-date concert information and the ability to track users’ listening habits to their Last.fm profile. The launch of Last.fm on Android marks the latest step in Last.fm’s expansion into the mobile music space. Using the Last.fm application, users can listen to streaming radio stations such as personal recommendations, similar artists, and genre-specific tracks. Users can also share tracks with their friends on Last.fm and stream other users’ stations. The new ‘Background Playback’ feature enables users to listen to Last.fm’s streaming music while accessing other programs, such as email, without interrupting the music experience. Last.fm users can view an on-the-go version of their personal music profiles that includes mobile versions of Last.fm Charts page and Artist pages, with biographies, tags, similar artists and top listeners, all optimized for the Android platform. Users can access Last.fm’s Events listings to browse artists on tour, search for events, view Last.fm recommendations and view mapped directions to music venues.